Lobo is a well-established company in Thailand, a pioneer in the development of ready-to-eat meals made with the finest ingredients and technology. Lobo is one of our top selling brands, with a fantastic instant tom kha, satay, tom yum, sweet and sour, and many others. 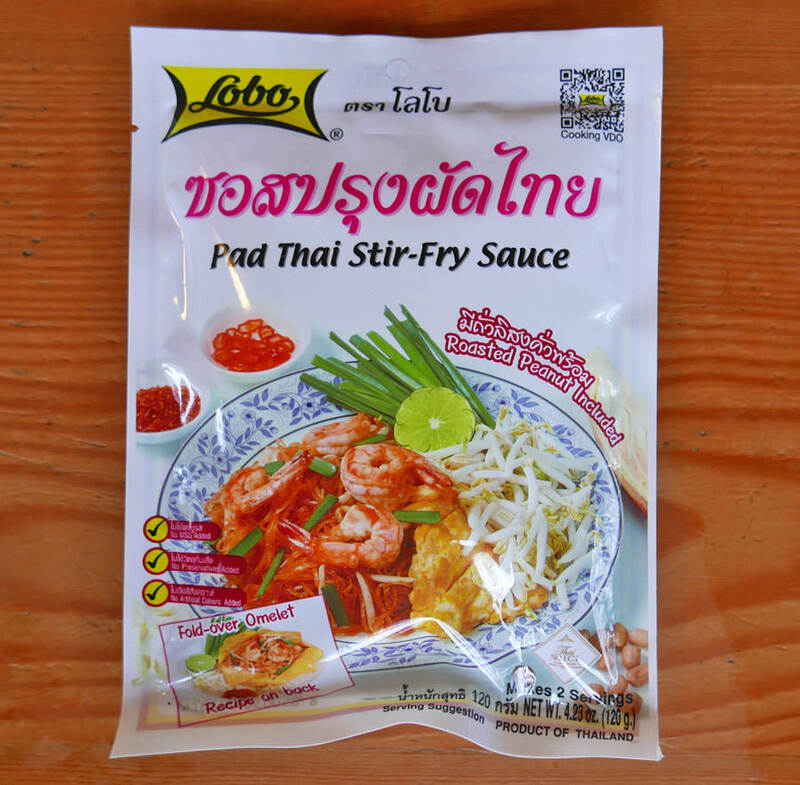 Their newest product is this Pad Thai Stir Fry Sauce. Each package includes one packet of pad Thai sauce, and one packet of crushed peanuts vacuum sealed. There are good instructions on the package, and it only takes a few minutes. Our very first batch was a success, and after that we made three more. This is a delicious instant Pad Thai! You need your own chantaboon rice stick noodles, an egg, some fresh lime, a spring onion or two, some shrimp or chicken, and bean spouts. Makes two large servings. Ingredients: sugar, roasted peanut, tamarind juice, shallot, fish sauce, tomato paste, garlic, soybean oil, vinegar, salt, chile oleoresin. See our recipe for authentic Pad Thai.